Fortuna Berlin is a metaphor for the self-­assertion of individuals against social conventions. 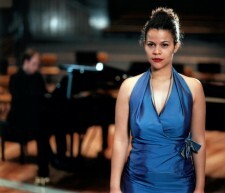 The stories of two women are told simultaneously: Justine, a 30-year old Haitian-Swiss soprano singer is invited to an audition at the Berlin Philharmonic Orchestra. When she arrives at the airport, her belongings are searched by customs officials who in their meticulous pursuance also break her stage shoes. When arriving at her host Anja’s apartment in Berlin, Justine is furthermore confronted with the reality this young amateur boxer lives in. The stories seem to merge and yet run parallel, each of the women pursuing their own fate and struggling against external circumstances and restraints. In a final sequence of occurrences, each of the women experiences a personal climax: Justine at her audition and Anja at a boxing match. 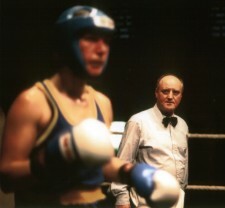 Rike Schubert and Reiner Kühn, Abteilung Boxen des SV Blau-Gelb Berlin.